If you’ve even visited the Royal Palm Golf & Country Club along Lahore’s Canal, you’ve probably noticed the high walls that keep the middle-class residents along Allama Iqbal Road, in the Garhi Shahu and Railway areas and the squatters that occupy Railway land near the tracks off the golf course. But anywhere else in the world, property that overlooks a golf course and country club usually gets picked up by the extremely rich. There must be something seriously wrong in our property development paradigm where land values can be so skewed. Our cities openly mock the example of Hazrat Umar patrolling the streets of Madinah. The starving dogs of Baghdad must roll in their graves. Immediately behind Lahore’s Pear Continental Hotel there is the basti/katchi abadi – call it what you will – that serves the leafy GOR-I enclave. Yet, if you were to stay at Lahore’s great 5-Star hotel and happened to need prescription medicine, the nearest pharmacy is well over a 15-minute walk away. Somehow, there are forces in operation that keep the land use in the basti from adapting to the needs of a 5-star hotel. One would expect the relatively cheaper land prices there to have attracted high-end retail stores, cafes, small galleries and pharmacies – the sort of businesses that benefit from offering services to tourists and visitors. But we live in a land of contradictions. Speaking of walking, if you live in any of the upscale residential areas and need something like a dozen eggs, chances are you’ll have to get into your car and drive to the nearest convenience store (those fortunate enough to have employees to carry out quotidian tasks rarely notice this irony). Urban society has become so used to the idea of the automobile that is has become confined by it. Surely one of the signs of the apocalypse is when men and women drive to a gym to use a treadmill. Our servitude to the road and to the car is complete, and I often roll my eyes when city fathers talk of “road development projects” when there isn’t an adequate sewerage system in operation. Parts of Gulberg and other residential areas have been commercialised over the last decade, and have given casual observers like myself an opportunity to survey the phenomenon. My amateur eye can’t find an explanation as to why residential home owners lucky enough to have had parents who bought land near a road that was luckily enough declared commercial are the recipients of windfall benefits while, at the same time, shopkeepers who abided the law and carried out their business for decades in the increasingly congested officially demarcated commercial areas have seen no corresponding increase in the value of their property. Why should only the residential home owners grow rich at the expense of legitimate business owners, simply because our town planners failed to estimate the growth of our cities? This is not how life and business should run in the urban areas of this Islamic Republic. But we live in a land of contradictions. Speaking of congested commercial areas, Dr Nadeem ul Haque, of the IMF, formerly of the PIDE and now a contributor to these pages (a formidable resume on any continent), is forever pointing out that government land is exempt from urban property tax. This means mere mortals must fork out a portion of the annual rental value of their land to the State while the State occupies thousands of acres of urban land without paying a cent. I’m not suggesting planners take to the streets, armed with T-squares and storm the Governor’s mansion, but surely it could be put to some public use that justifies its urban property tax. Even George W Bush in his White House has to make way for throngs of tourists who pay for the opportunity of witnessing one of the most prized properties in their nation. Urban property tax is actually routed to local governments, so what’s the sense in keeping these minnows from spreading their wings by depriving them of legitimate revenue? Why not make the State Guest House a museum or a gallery. Something open to the public. After all, it’s their money and property tax that’s paying for its maintenance and upkeep. Our urban laws and management is equally baffling. If you want to run a rickshaw on the Canal you need permission from a provincial secretary authorising your eligibility to buy a CNG rickshaw. If you want to run an outdoor advertisement, you needed to speak to the chief gardener of the city? The Parks and Horticulture Authority, technically responsible for keeping the city green and beautiful, hence the Gardner Laureate, regulates (I use the term loosely) the numerous hoardings you see littering the city’s skyline. If it seems like an odd hat to put on a gardener, it is. What’s more, this misplaced responsibility (it should be the Town Nazims, like everywhere else in Pakistan, who should regulate and enjoy the benefits of outdoor advertising) means you can’t expect the PHA to take decisions keeping the health and safety of its residents in mind. The fact that it has granted a handful of companies permission to advertise on huge LCD screens (as has the Cantonment Board), despite the protests of senior police officials and the obvious traffic hazard they represent, in a case in point. The advertising revenues of mobile phone and milk companies, it seems, trumps the safety of the people. But this is what we have now come to expect. Each one of these contradictions points to malaise. None of these things would happen in a humane society or a rational market. We have, it seems, neither. We may speak high and mighty of reforming our Constitution, but no one has conducted a proper traffic survey of this, the second-largest city and commercial hub of the country (the ones put forward by traffic constables and planners with decades-old qualifications simply can’t be taken seriously). Rigid and irrational laws and urban property taxation practices dampen the development of land use and give things like the 90 acre Governor’s Houses, golf and polo grounds, those who enjoy them and the rolling lawns of Punjab’s senior bureaucracy while, at the same time, half the residents of the city live in squalor. These contradictions are endemic. You can’t pick just one scab and pray the pox disappears. We stare at these glaring contradictions every day. Not just in our urban lives, but in the way this country is run. When Geo ran a TV poll asking viewers if they would take the law into their own hands and punish perpetrators of crime, over 70 percent said yes. We must act now and save ourselves from ourselves. 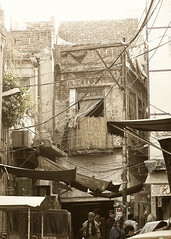 This entry was posted in Civic, Lahore, Urban and tagged development, Lahore, skewed, Urban, urban planning, Urbane. Bookmark the permalink. I believe there is an ambitious urban renewal project being initiated for the Mall but I’m not sure if its purely an aesthetic renewal or whether there will be provisions for traffic management. One things for certain – lahore needs to learn from Enrique Penalosa with regards to social justice and transportation issues.